THE WRITING BUDDHA - Opinions | Books | Movies: The Prince of Patliputra by Shreyas Bhave (Book Review- 4*/5) !!! 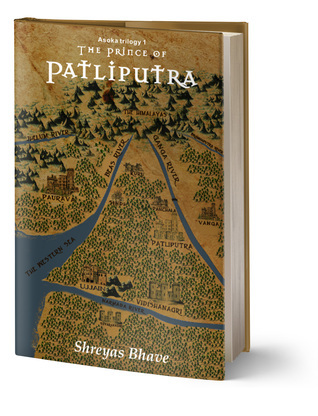 The Prince of Patliputra by Shreyas Bhave (Book Review- 4*/5) !!! Reading historical fictions have become a new habit for me considering the number of books releasing in this genre these days. Greatest fact to know is that almost all the writers in this genre are of younger generation who are either in college or just passed out of it. Shreyas Bhave is the newest one to release his book in this genre with his first book in the Asoka Trilogy named "The Prince of Patliputra". He is just 21 years old and studying in an Engineering college. The book is almost 400 pages thick and this young debutante should be applauded for his work. Not even once did I feel that an experienced hand was needed to write this book. He has given his 100% which is quite reflective in each and every chapter that you'll read in this thrilling story based on the history of Asoka. Shreyas Bhave's command on the language is great which makes the reader in you very happy about it. Trilogy is the new cool in Indian publishing market since the emergence of Amish Tripathi. But not all authors are doing justice to it. I am glad to find Shreyas understanding the concept and choosing a perfect plot for each of his book. The sequence at which the first part has ended gives you enough impatience to read the next one. Not many trilogies are making you feel like that. The way the author have carved each of the characters tells you how creative he is. Though the history has been read by us during school time, yet you do not feel it boring when you read it through Shreyas's eyes. Coming to the book, the initial chapters are little confusing and you find yourself trapped in it. You want to finish the book earliest so that you can move out of the jail. But as the purpose of the book starts becoming clear about 50-70 pages or so, you start getting addicted to it. The political strategies, wars, military experiences, battles and everything that is discussed adds charm to the story. The way Chandragupta Maurya and Asoka's story runs parallel makes it easy for you to understand why Asoka is considered to be the perfect successor to his grandfather. Also Chanakya's character win you over with its own charm and wit. Radhagupta's character is also well-justified. The mention of Alexander in the flashbacks also comes like a fresh air to us. Overall, the book is a clear winner except few spelling errors. I give it 4 stars out of 5. Hats off, Shreyas. Why we insist to learn from our OWN MISTAKES? ?